Powerwolf are a German metal band with the Romanian frontman Attila Dorn who graduated from classical opera studies at the academy of Bucharest. Respecting his origins, he gives the band a vampirish touch. But image isn't everything, his voice is really extraordinary. Especially on the doomy The Evil Made Me Do It, he's sounding as dramatic as Candlemess' Messiah. 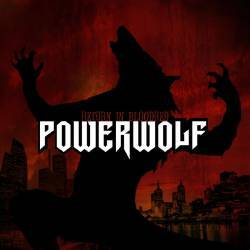 The most astonishing thing about this record is that Powerwolf play quite classic melodic mid-tempo metal, but they were able to create an interesting work with a lot of variety. The opener Mr Sinister is a very impressive song close to Savatage's Sirens period. Black Mass Hysteria is a tribute to 80s metal values, Demons & Diamonds and Montecore are two metal hymns, and Lucifer In Starlight is a more epic track reminding a lot of Merciful Fate. The only disappointing song is Kiss Of The Cobra King, a rather simple sing-along tune. But on all songs, I appreciate very much the strong use of organs creating a spooky touch on the whole album. Funny samples as crying babies or church bells do also contribute to the occult atmosphere. Return In Bloodred is one of the best traditional albums I've heard for a long time and I'm sure that not only true metal fans will like it.